Booth/Cleary Introduction to Corporate Finance is the only ground-up Canadian introductory finance textbook on the market. 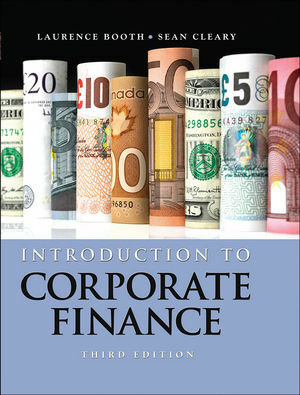 The text’s authors, internationally renowned researchers, Laurence Booth (University of Toronto), and Sean Cleary (Queen’s), provide students with a solid foundation in the theory and application of corporate finance topics within a uniquely Canadian context. The authors present complex material in an accessible and applied fashion, which gives students both a strong understanding and an interest in the subject. Booth/Cleary Introduction to Corporate Finance is the only book that will provide students with the skills they need to succeed not only in the undergraduate course, but in their future careers. Unique Framework and Organization: Introduction to Corporate Finance is written with a unique framework, recognizing that finance is built upon three distinct legs: economics, accounting, and law. It is organized to cover investment topics first and corporate finance topics second, showing students that these are really just two sides of the same coin. Ground-up Canadian Content: This fully Canadian text has a richer level of detail for topics that are important to Canadians, such as investment banking practices, securities law, the tax impact on income trusts, and arbitrage between Canadian and U.S. markets. Global Coverage: The textbook integrates international issues on a topic-by-topic basis, as they arise, rather than in a separate chapter where they are just “lumped together.” In this way, awareness of international issues develops naturally. WileyPLUS: This powerful online tool that provides instructors and students with an integrated suite of teaching and learning resources in one easy-to-use website, and includes a wealth of resources that help teachers teach and students learn. Finance in the News: Each chapter includes at least one article or item from the financial press that help students draw the connection between theory and application, and highlight the real-world significance of the topic being discussed. Ethics and Corporate Governance: Found in each part of the text, this feature includes an item relating to ethics and corporate governance, and illustrates how these issues affect corporations today. These items are accompanied by questions to help generate in-class analysis and discussion. Lessons to Be Learned: These illustrate an important concept in the chapter, and how that basic tenet of finance was either ignored and thus fuelled the financial crisis, or was adhered to and helped to mitigate the effects of the crisis. Worked-Out Examples with Solutions: Worked-out examples include Excel spreadsheet commands, as well as step-by-step keystrokes for the TI BAII calculator to enhance students’ understanding of how to work through the chapter material. Concept Review Questions: These are based on the learning objectives for that section and help readers to check their understanding. Answers are provided in the instructor’s manual. Weekly Updates: Instructors can keep their course current by staying on top of the latest news in finance with Wiley’s Weekly Updates. Each week Wiley delivers three to five new video clips and news stories, accompanied by discussion questions to spark debate in the classroom.